This morning I left Dan snoring in bed. It’s a Saturday and I love that lazy feeling where you wake up, check your alarm and realise that it’s 8 o’clock and that you have actually managed to sleep through your normal 6.30 am get up time. I spent the next half hour listening to the wind and the birds and thinking of something and nothing, coming in and out of sleep – my Saturday morning treat. This morning my thoughts morphed slowly from some photo’s I wanted to take of the garden, to my 4 year old nieces birthday to a peach cobbler I was eager to make. I wasn’t eager to make it last night, in fact I hadn’t actually even considered it, and I didn’t wake up thinking ‘I should make a peach cobbler’ but that is where my thoughts ended up and that is why I love that half sleep that only a Saturday morning gives time for, in our house at least. Much as I love that time, once I am awake that’s it. I hate laying there wasting my precious morning. I had also, by this time, gained enough consciousness to remember that I had a punnet of nectarines in the utility room that had failed to ripen. I bought them last week knowing that it was probably far too early in the year to encounter a soft, juicy, sweet nectarine, the kind you need to eat in private, accompanied by the dish cloth, but hopeful that I was wrong. A quick glance at the clock told me it was 8.30. Grabbing dressing gown and slippers I crept downstairs eager not to wake the girls, partly as they need the sleep and partly as I wanted a few selfish minutes downstairs alone, just me, Jess and the kitchen. Half way down, the light growing brighter, I realised that I had left my glasses on my bed side table. Oh well, I would have to make do. So, peach cobbler for breakfast! For the past few months my Saturday morning breakfast has been fruit and yogurt. Preferably soft fruit and honey yogurt, and it’s totally delicious. But today it was grey and cloudy and the weather man warned me that it was foolish to even consider hanging the washing on the line, so peach cobbler it is. Well, nectarine cobbler actually but peach cobbler sounds better for some reason. Fast forward a lazy hour (the cobbler only takes about 15 minutes to make) and the house smelt of coffee, baking and incredibly perfumed fruit. If those nectarines had actually managed to ripen they would have been gorgeous fresh from the fruit bowl. The sound of snoring was gone and it had been replaced by the gentle patter of rain. The cobbler was delicious. The fruit is not too sharp, not too sweet and the biscuit is beautifully short and crispy on top and slightly soft where it was resting on the fruit. For breakfast we ate it with a dollop of yogurt but it would be just as nice with cream or ice cream, served for dessert. Feel free to make this with peaches, as the name suggests, or nectarines. Either work just as well, it’s just that nectarine cobbler doesn’t have the same ring to it. I reckon this would also be delicious made with plums later in the season, just make sure you adjust the sugar quantity according to how sweet your fruit is. Put the peaches, vanilla, sugar and cinnamon in the baking dish, toss together and place in the oven for 15 minutes. Rub the butter into the flour using your fingertips. When all the butter is incorporated, stir in the remaining ingredient. Now add the water slowly (as you may not need all of it) using your hands to bring the dough together into a ball. 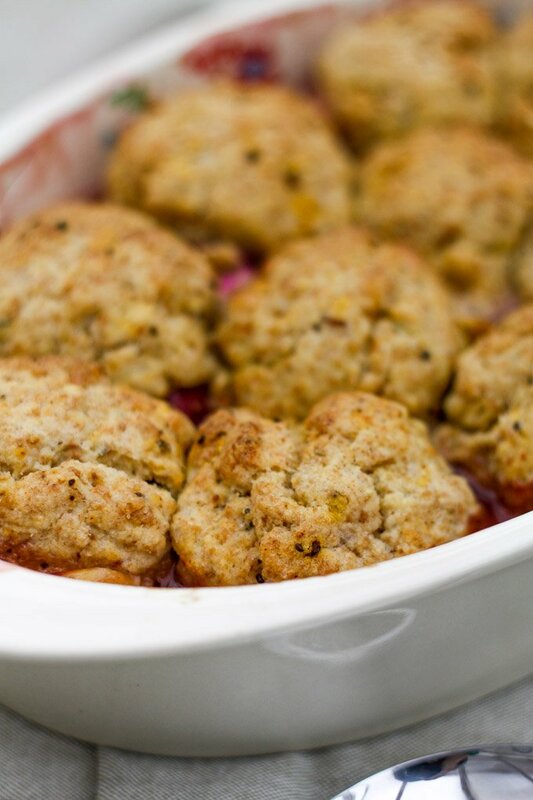 When the peaches have had their 15 minutes, remove them from the oven, give them a little stir, and place balls of the dough on top of the peaches. I like to make about 12 small dough balls although 6 big ones works equally well. Return the dish to the oven for 15 to 20 minutes. Cooking time will vary slightly depending on the size of the balls and each individual oven. When the balls are golden brown and peach juices are bubbling up at the side of them then remove the cobbler from the oven. Serve hot, warm or cold with cream or ice cream. I have rhubarb which is a late variety so no good for those pale pink recipes all the magazine’s show in Feb and March but now that the magazine season is over I discovered this and thought “why not”. It works very well but was a bit juicy so the cobbler was a soft version underneath.